One mundane girl, three Goths, and one Steampunk sharing a Frat-House? What could possibly go wrong? Desperate and alone, Becky shows up on their front porch, suitcase in hand. Do they take her in or turn her away? Becky Sparks is a sweet, average girl who refuses to spend her college years in a lonely, soul destroying dorm, surrounded by people who don't care enough to ask her name. Bassist Kelley Keele is a Goth with a dark past. He resides at what he and his equally eccentric bandmates, Crispin, and Dorian, like to refer to as the House of Goths. On the first day of class, these two polar opposites literally crash into each other. Mesmerized by his overwhelming persona, Becky forms an instant bond with the scary Goth with red streaks in his hair. So much so that when she spies him putting up an ad for a fourth housemate, Becky jumps at the chance to move in, away from her dreary life at the unfriendly dorm. The problem is, well, she's a girl and a mundane one at that. ❥ Great book!!!! Absolutely loved it! ❥ This is absolute pure 100% gold. I love this book! ❥ Is it wrong of me to be crushing on both Crispin and Kell at the same time? ❥ I love this book, a series would be great. ❥ Crispin seems to be my favorite character for some reason. 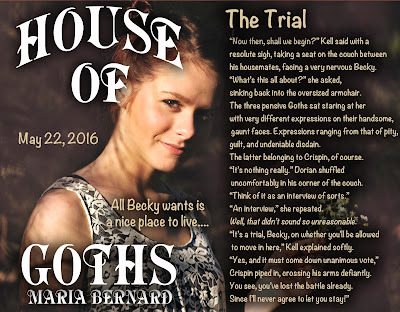 ❥ I love how the Goths interact with Becky-hot and sweet - happy the book is coming out so I can binge read!!! House of Goths is Live!! !